Likes: Squeakers, tennis balls, He LOVES to run and it would be best for him to have a fenced yard. He also likes belly rubs, wrestling (nicely) with other dogs, and running. Hi! I’m Dexter. I just had a birthday and turned 2. 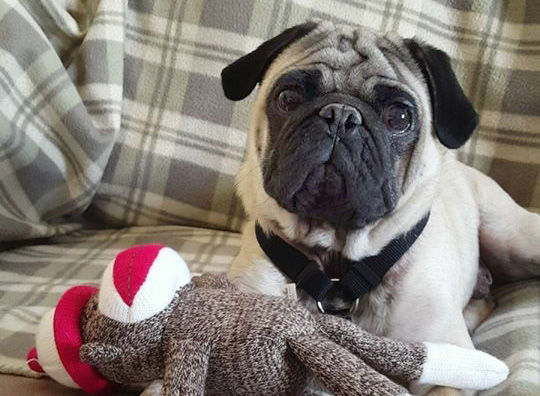 I’m so excited that the people with Pug Partners took me in and placed me in a great foster home. I’ve learned to trust more and am discovering people can be pretty great to be around. They give belly rubs and let me chill on the couch with them and sleep in bed which I think is pretty amazing. I love going on walks, exploring new outdoor smells, and going for car rides to the pet store to pick out new squeaky toys. I visited my foster mom’s family for a few days and there were lots of dogs that looked like me and even a few cats. I did really well with meeting everyone new. The cats didn’t want to play much so I just left them alone. My foster mom says I’m pretty special and am going to be a great addition to the right family. When she goes to work she puts me in a dog playpen and she says I’m such a good boy. She doesn’t put me in a crate when she has to leave because I really don’t like those things. I’m not sure about these manners she keeps talking about, but she says I’ll get the hang of all of them with someone patient while I learn. She also tells me I’m super smart! I learned how to “sit” for a treat very quickly! I also know that the leash means I get to go outside, and I get very excited to wear it. She says someone who is home often would be great for me and while I would do OK with another dog, I don’t need one if I have someone who will give me all the attention I want (which is quite a bit). I would love to share your couch as well as your bed. I hope you like kisses too because if I like you, I love to show it. DEXTER REQUIRES A FULLY FENCED IN YARD AND NO KIDS LESS THAN 10 YEARS OLD PLEASE. Interested in adopting? Dexter’s minimum adoption donation is $400.